Should You Use an Exercise Ball as a Chair? Can using an exercise ball as a desk chair help you develop core strength and better posture? The theory is that when sitting on an exercise ball, your body is constantly making small adjustments with the postural muscles, abdominals, gluteals and leg muscles. It is "active sitting" rather than the slumping and poor posture we develop even in ergonomic desk chairs. One study found that those who used the ball as a chair in an office setting thought it improved their posture, balance, and energy levels. But various other studies didn't find significantly increased core muscle activation and no difference in energy expenditure. You are unlikely to burn significant calories simply from sitting on an unstable surface. It may also not be enough to reduce the health risks of sitting too long. One study found almost half of those who used the ball reported some pain when using it. Stuart McGill, PhD. in "Low Back Disorders" cautions against the use of an exercise ball as a chair if you have lower back pain. If you experience increased lower back pain when using the exercise ball as a chair, discuss with your medical provider and consider discontinuing use. Is Sitting on a Ball Ergonomic? Those who design and sell ergonomic desk chairs, which cost hundreds of dollars each, naturally caution you about using a $15-30 exercise ball instead. Certainly, those with back pain and other musculoskeletal disorders need to use caution when changing chairs for hours of sitting. You must get the right size ball. Your thighs should slope downwards slightly rather than be at 90 degrees. But the ball should not be so tall that you end up balancing on your wrists at the keyboard. Research studies have not borne out benefits for using a stability ball as a chair. However, many physical therapists, kinesiotherapists and personal trainers use stability balls as chairs. Perhaps it is a fad, but it is one with many converts among exercise and therapy experts. When starting out using a ball, you should begin with a half hour or less and build up your time each day to see how you tolerate it. Rather than using a ball chair exclusively, you may want to alternate between an ergonomic desk chair, a ball chair, and other forms of active workstations. A treadmill desk or a Deskcycle under-desk cycle exerciser are other alternatives that will increase activity. Once you have the ball handy, it is easy to just roll back from the desk and do a few ab crunches. The ball doesn't cause hip pain as can happen when using a mat and you won't mess up your hair since your head won't touch the mat or floor. "Low Back Disorders" Stuart M. McGill, Copyright 2002, Human Kinetics. Lowe BD, Swanson NG, Hudock SD, Lotz WG. 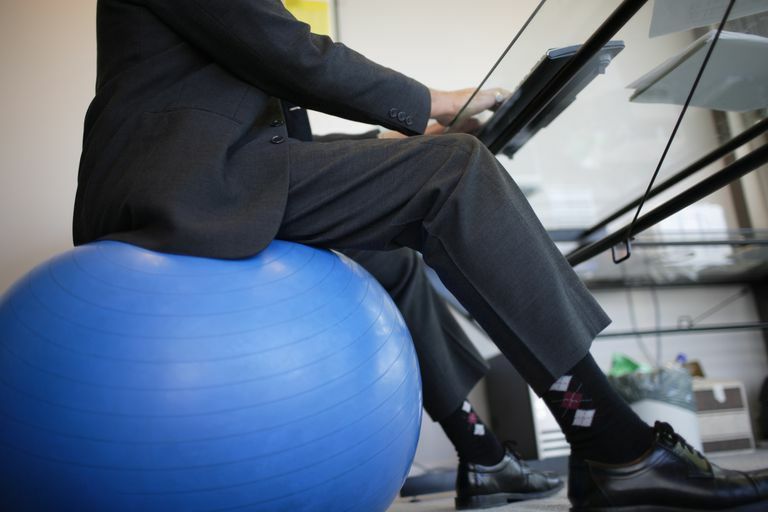 Unstable sitting in the Workplace—Are there physical activity benefits? American Journal of Health Promotion. 2015;29(4):207–209. doi:10.4278/ajhp.140331-cit-127. Schult TM, Awosika ER, Schmunk SK, Hodgson MJ, Heymach BL, Parker CD. Sitting on stability balls: Biomechanics evaluation in a workplace setting. Journal of Occupational and Environmental Hygiene. 2013;10(2):55–63. doi:10.1080/15459624.2012.748324. Tudor-Locke C, Schuna JM, Frensham LJ, Proenca M. Changing the way we work: Elevating energy expenditure with workstation alternatives. International Journal of Obesity. 2013;38(6):755–765. doi:10.1038/ijo.2013.223.